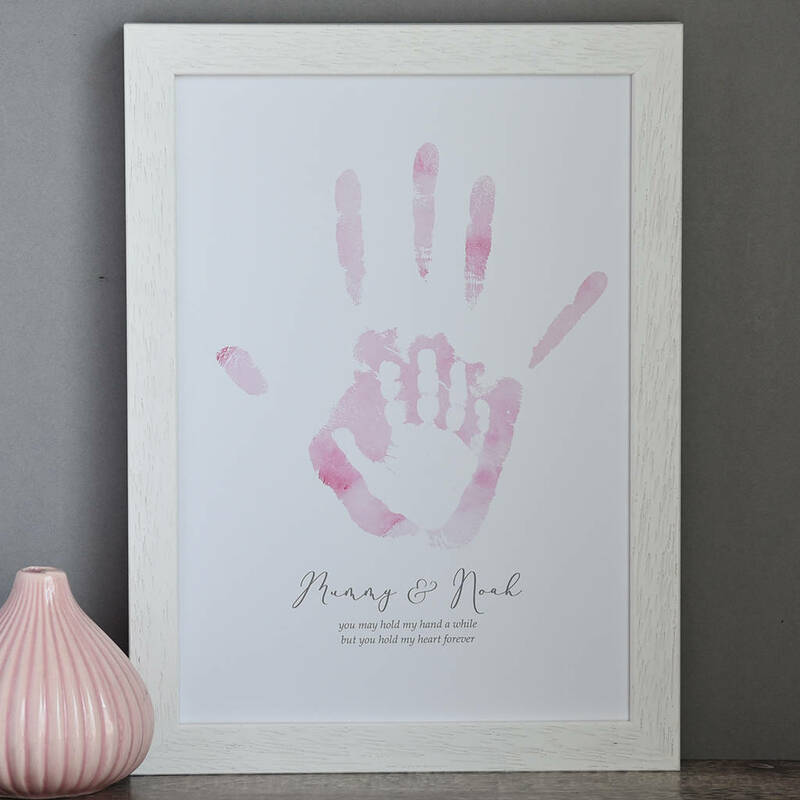 A personalised nursery print, featuring you and your little one's own unique handprints in shimmering gold or rose gold foil. 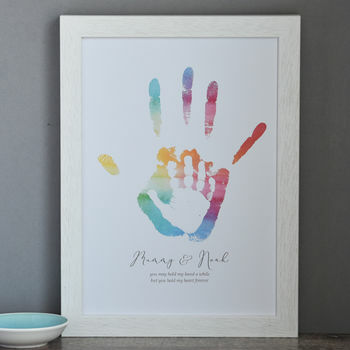 Perfect for handprints from a new baby and parent, each unique print will feature your names above the text "You may hold my hand a while, but you hold my heart forever.' A perfect keepsake of their tiny hand, this beautiful print is available both unframed or framed as pictured, simply select from the options above. We can work with paint or ink prints you already have, or can provide a simple kit so you can capture your hand and footprints at home. Our kits contain inkless wipes that are mess free and easy to use. Once you have your prints simply contact us via NOTHS, attaching high resolution scans or photos of each print. Printed on 200gsm paper. Our white wooden frames are hand made in the U.K. and glazed with perspex. This product is dispatched to you by Hold upon Heart. The "get it by" date assumes that prints will be provided when placing the order. If prints are provided after the order date then the estimated dispatch and delivery dates will be updated to reflect the making time of approximately 1 week for this item. If your order is urgent and you need it faster then please get in touch as wherever possible we will do our best to help. Unless the tracked express delivery service is selected, this item will be sent by recorded delivery, and will usually arrive within 3 days of dispatch. A signature will be required upon receipt.